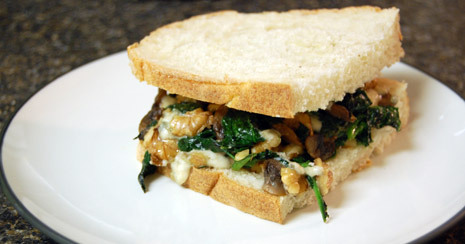 I love trying spinach melts, but they usually taste more like spinach and artichoke dip and are a bit too rich in my opinion to then make into a sandwich. However, after trying the spinach melt at Three Sisters Cafe I found one that I loved. By the time I got around to trying to make it at home, I had forgotten most of the ingredients other than the spinach and gorgonzola cheese (yes, gorgonzola). I think they also included water chestnuts, but I never have those on hand. So instead, I sauteed the spinach with mushrooms. I then mixed that combo with some crushed walnuts and crumbled gorgonzola cheese. I put all of that on top of some artisan bread and baked it in the oven until it was a nice melted consistency. The result was almost as good as Three Sisters, and is definitely one I will make again. The ratio of ingredients is up to you (I think I make mine different every time.) I also think that this would be a great heavy hors d�oeuvre to serve open faced on a mini toasted baguette. Liz, I agree. Ithink it would make a good hors d’oeuvre.